The Eagleman Stag is a rare feat of short filmmaking. Resolutely strange, mysteriously beautiful, Michael Please’s Royal College of Art dissertation + recent BAFTA award-winning film is a masterpiece of both conceptual and technical prowess. Stirring monochrome models and sets pair with a foolishly ambitious, but breathless narrative, to create a whole which is unlike anything you’ve seen before. Epitomizing the promise of the form, The Eagleman Stag is a true realization of short film’s inherent potential to birth works that are not amateur derivations of popular forms, but emergences of the new. It’s a bold move to present a lifetime within a short film, and Please by and large pulls it off. Peter is imagined from birth to the point of death (and perhaps beyond that, in a stunning, though ambiguous finale) via representative moments plucked out from Peter’s life. While this advances the theme and plot well, the film is resolutely a writer’s piece rather than a character’s. The 9 minutes of the film fly by due to design brilliance and surprising wit, but the wit belongs to Please, and it is hard to feel empathy for Peter, who comes off as something of a crank. Still, it is a mature effort on Please’s part to conceive of, and execute, such a high-concept. While the animation might be more lauded, the sheer audacity of the storytelling resonates with audiences I believe, comprising a large component of the film’s near universal acclaim. During my several years in short film I struggle to recall a single film so excitedly received. Though only now appearing online, the film has been a resolute smash at festivals, playing high-profile gigs like Sundance and SXSW, winning awards at Annecy and Clermont-Ferrand in addition to the BAFTA win, and joining prestigious collections like Wholphin and FutureShorts. I’ve refrained from discussing the animation at this point, not out of any slight, but really because there is too much to say. It is the most immediately striking and original aspect of the film, and, at festivals, has often confused audiences as to what they were actually seeing. According to Please, aside from compositing on a couple of shots, the film is achieved “100% in-camera” via stop-motion. Using a secret foam that he guards somewhat mysteriously, and which has become something of a trademark of his, Please and an all-star team of young, student talent including Dan Ojari, crafted each element of the film by hand with a scalpel (that includes the grass!). The result is an extremely clean, graphic look that is divorced from the messy, earthy, clay figurines and puppets we generally associate with stop-motion, and thus has been frequently confused for CGI. The movement and modeling is superb, as is the writing, but one final technical aspect I would like to call out is the camera-work. The lack of texture and color, while striking, force an extra emphasis on lighting to create dynamic contrast. Please lights the film amazingly, most notably to me in the incredible “fishing scene”. More so than that though, he also introduces an incredibly sophisticated and confident series of camera-movements to the work, creating several in-camera transitions, between scenes which are quite nice, and more than one bravura sequence—the miniaturized sprint through the University being a favorite. 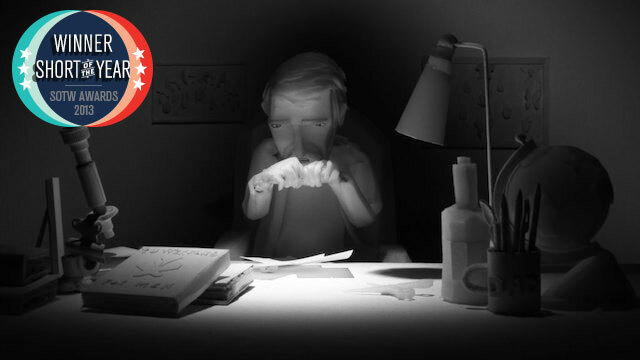 Writing, animating, filming, where does this film lack? In numerous interview’s Please has proclaimed animation the “Greatest of Arts” due it being a “Frankenstein’s Monster”—a blend of many disparate disciplines, combining all the fields of his talented artist family: his mother a sculptor, his father a writer, and his brother a musician who provided the score for the film. Ultimately it is this diverse excellence that elevates The Eagleman Stag. We see numerous films that take risks with storytelling, and every year we see an animated film that knocks our socks off through design and craft, but to see a complete film of this quality and far-reaching range is something special. I’m happy it has arrived online so that I have an opportunity to share it with you, and so that we all get to watch it as many times over as it deserves. The film has come online, in part, to promote Please’s crowdfunding campaign for his newest short film, Martyn Myller so I encourage you to check it out and consider contributing.